A beautiful and heart wrenching story of a young girl ripped from her home when France was occupied by Germany. She tries to save her little brother. The tears won’t stop flowing, your heart will race, your life will change. Read this book! “Are you afraid in there?” she said softly, as the men called out for them. She closed the door on the little white face, turned the key in the lock. Then she slipped the key into her pocket. The lock was hidden by a pivoting device shaped like a light switch. It was impossible to see the outline of the cupboard in the paneling of the wall. Yes, he’d be safe there. She was sure of it. The girl murmured his name and laid her palm flat on the wooden panel. This story left us speechless, breathless & heartbroken. It is a beautiful story of unconditional love, determination and perseverance. It is the kind of story that will linger in your soul far after you’ve turned the last page. No matter how many books we read about this time period and how many different accounts of the horror other human beings endured, we will always draw breathes deeply and feel the sorrow deep in our bones. Sarah made a split second decision to hide her brother in a cupboard of sorts to protect him from the German soldiers. She promised she would be back for him. Sarah’s decision that day was one that would haunt her for the rest of her life. She stops at nothing to find out what happened to her little brother. Told between two time periods, Tatiana De Rosnay manages to write a story that comes alive in a readers heart. We just loved this book! Tatiana de Rosnay was born on 28 September 1961 in the suburbs of Paris. She is of English, French and Russian descent. Her father is French scientist Joël de Rosnay, her grandfather was painter Gaëtan de Rosnay and they were born in Mauritius. Tatiana’s paternal great-grandmother was Russian actress Natalia Rachewskïa, director of the Leningrad Pushkin Theatre from 1925 to 1949. 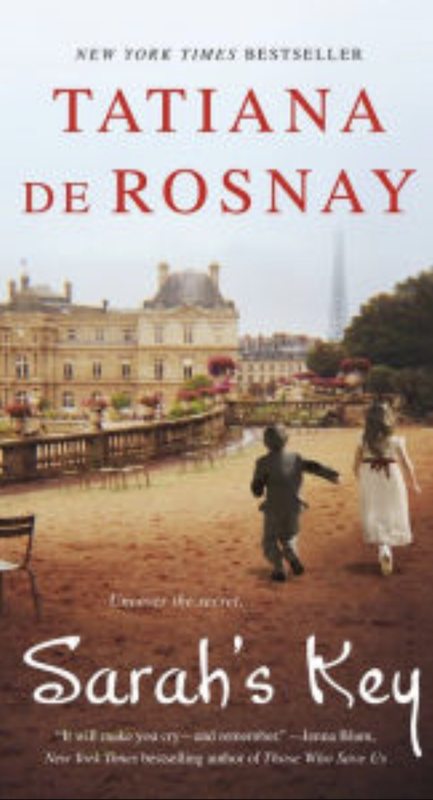 Since 1992, de Rosnay has published twelve novels in French and three in English. She has also worked on the series Family Affairs for which she has written two episodes with the screenwriter Pierre-Yves Lebert. This series was broadcast on TF1 during the summer of 2000. In 2006 de Rosnay published her most popular novel, Sarah’s Key, today the book has sold over three million copies in French and almost two million in English. In 2009 the book was adapted into the French film Sarah’s Key by Serge Joncour, with Kristin Scott Thomas as Julia. Such a good read. I totally cried. Me too! Like all out snotty cry! Same!! But I honestly love when a book gets me that emotional- it’s how you know it’s good! 100% and I read it years ago and still remember it like i just turned the last page. I agree, such a good book, but so sad. I really enjoy reading books about this time period. So awful to see what people are capable of doing to each other. I also LOVE reading books from this time period. Have you read Storyteller by Jodi Picoult? I have several of her books, but not that one. Is it about a similar issue? I will give this a read!